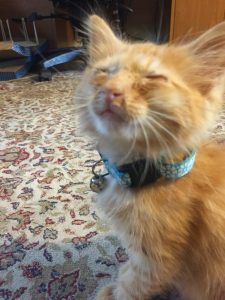 Before we left for vacation I talked about the kitten we were going to get when we got back, but other things were in store for us. If you want to hear the whole story (it’s amazing, truly) keep reading. 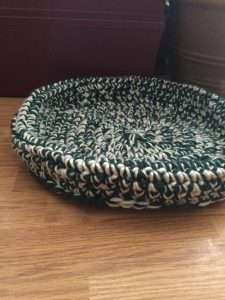 If you only want the crochet pattern scroll down. Suddenly on the lane opposite us there was a deer. Just frozen in the lane, almost right on the line, with her head just staring in the opposite direction. (Seriously, never seen one just so frozen and staring opposite an oncoming car before.) My Mom was driving and slowed down immensely. As we approached the deer, she turned and looked straight at us. You probably could have counter her eyelashes, that is how close she was. My niece says “That was COOL! It was so close!” I replied “It was close, but it was not cool!” If she had bolted it would have been a disaster. My mom slowly sped up, but not too much, because there were obviously deer about. We were going so slow that we saw two kittens on the side of the road in the grass. If we were going faster they would have looked like they could be anything, but at this speed they were obviously kittens. (Fate-3) My mom kept driving, (blows my mind too) but I spoke up, and my son and niece joined in. We straight guilt-tripped her. “How could you leave two tiny babies on the side of the road!? 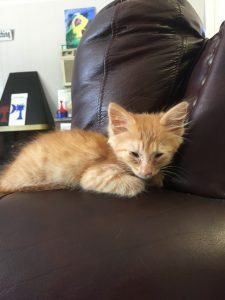 !” She turned around, and then around again to get us on the right side of the road for the kittens, and there, laying in the shallow ditch, was a baby, an tiny orange furry baby. I got out of the car and picked him up. He did not hiss, spat, or anything. I looked around for kitten number 2. My husband had been very firm that we could only have one kitten, but I was not about to rescue one and leave a second kitten on the side of the road. Holding one kitten firmly and glancing around there was no other kitten. I did see a cat head, possibly Momma cat, but by the time a flashlight was found that cat vanished. (Fate-4) My niece, son, and I stood searching awhile for any side of more cats or kittens. We could not find one. We scanned the field over and over with a flashlight, nothing. Here was the one kitten we would be allowed. I have no idea what we would do if there had been more kittens. For the record, every single time we drove past there again we slowed down, scanned the field and never saw the first sign of another cat. That was a late night. By the time I got both kids and that cat to sleep it was 1:30 in the morning. First my son went to sleep, then I went to check and my niece was playing with the cat and said he was crying, so I took the cat. He’s a snuggler, here he was, within hours of being found, laying on my shoulder and sleeping. So I took him to lay with my son. That woke my son up. Got my son and the cat to sleep, my niece took awhile. The next day we took the cat to my parent’s shop to keep an eye on him, take care of him, and try to figure out a name for him. The kids took name suggestions from everyone who walked in the door that day, and my son picked his favorite at the end of the day. The name was Kismet. There were a lot of good suggestions, but I said that no suggestion quite showed the amount of fate, destiny, or God involved the way Kismet did. Kismet had a cold, plenty of fleas, but otherwise seems as healthy as a horse. We took him to the vet while still on vacation, got him flea sprayed, and got some medicines for the cold. Then we brought him home, to love him forever. 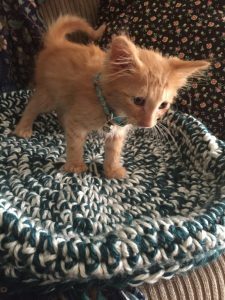 Before we left for vacation I was writing a blog post about the kitten that was supposed to be, and realized I wanted a new bed for her. 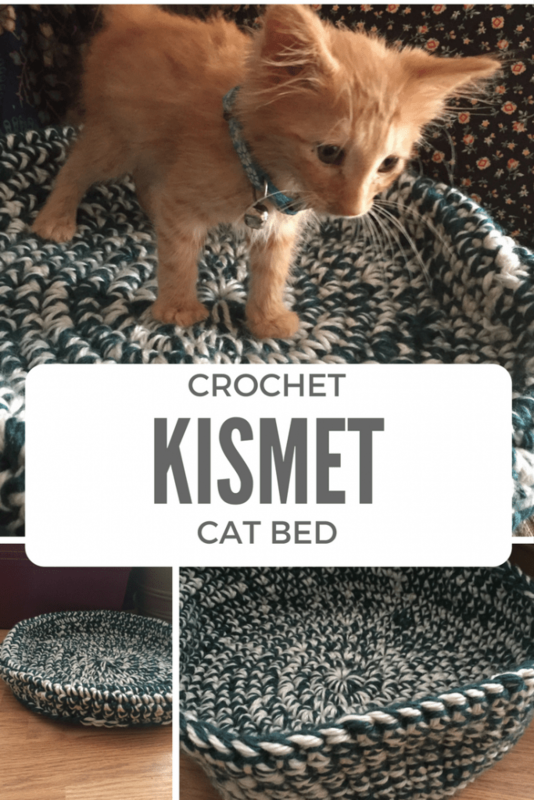 I wasn’t ready for a new baby in my old man’s bed, and so I designed and made a quick and easy crochet cat bed. The whole time I was thinking about finding a kitten (Fate-5 perhaps) and I was going to name it the “Wow a Cat! Bed” picturing it as something you make after suddenly finding yourself with a cat. 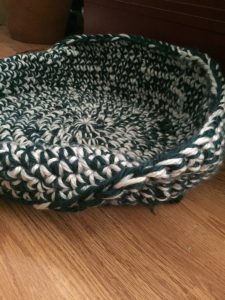 The entire project takes only a few hours, so you could find a cat and have it a nice bed in no time at all. Size 17 Hook- It’s a big hook! 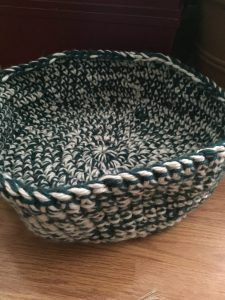 If you don’t have a jumbo size like this then you can still make the pattern, it will just take more rounds to get a good size, and you won’t be able to hold the yarn double. You will work in rounds, and just keep going and going around and around, so you your method of choice or marking the beginning of the round. Or just wing it, whatever. If you’re off by one or two it won’t matter. It is only a cat bed. It could be shaped like anything, it’s a cat, so they probably won’t use it anyway. 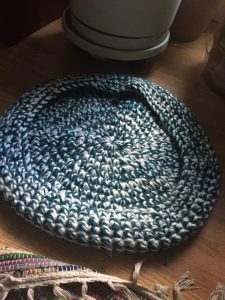 Continue each round adding 1 stitch before doing 2 SC in next. So the next round 2 SC in one stitch, then 3 sc. Continue until the size is what you desire. We tend to end up with large cats, so I made it large, with 9 stitches between each increase. Mine is about 13″ across. Now, Stitching in the front loop only sc around with no increase. Now SC in each stitch (both loops) until the walls are as tall as you like, or you run out of yarn. The walls can be folded up, down, in, or out to create different looks and shapes, since cats can be finicky. If you have the time and don’t need an almost instant bed you also can fold the walls down and sew it so that it is doubled on the sides. You could also sew it and stuff it to create a plush edge. So if you find yourself driving along at 10 pm and discover a cat, you can at least be ready to make him a bed. Since it works up quick it would also be a lovely service project to donate to an animal shelter. For those curious, no we didn’t also get the original kitten, the one kitten rule stands. We are sure though that the owner will find a home for it. You neglected to mention the other deer at the side of the road when y’all finally convinced me to turn around. In my defense I knew how our next couple days would be taking a kitten home in the middle of the night. The kids up half the night and cranky the next day. Ahhh, a few days of grumpy kids vs hopefully years of kitten/cat snuggling. I’ll take that trade. I was so excited and into guilt-tripping you that I forgot about the other deer!